Okay you crows and mockingbirds. How much do you really like my tomatoes? So tell me the truth. 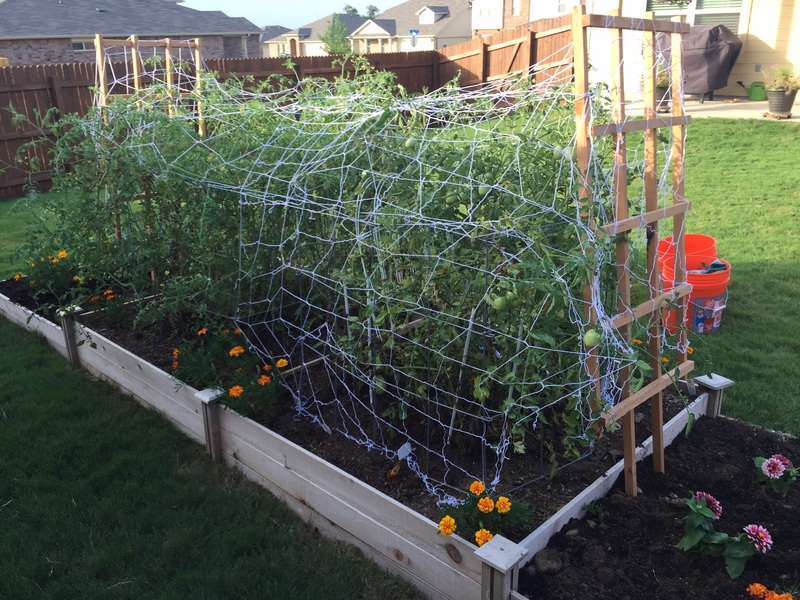 Is netting really going to keep the birds away from my tomatoes? Given that my garden now looks like a huge spider web, I hope so. It was fairly easy to put up — I put a 5-foot tall trellis at each end of the two 4×4 tomato beds, then anchored one set of 5×15 netting on them. Because the birds seem particularly fond of the big tomatoes, I criss-crossed another piece of netting over them. Sunday’s 3-plus inches of rain kept the ground saturated, so the trellises went in pretty easily. And I wound some of the netting around the ends of the trellises, hoping to anchor it a bit more. Of course, I suppose one crow or mockingbird flapping its wings around it could take the whole thing down. I’m hoping (fingers crossed, even) that won’t happen. Fingers crossed even more that this works just a little bit. I’ve heard both success and failure stories, so I feel like I have a 50-50 chance. Right now, the birds and bugs are getting more than 50 percent of the tomatoes, so what do I have to lose? The netting around my tomatoes looks like a huge spider web. As long as I was at it, I actually weeded all the beds, too. Thankfully, there weren’t near as many weeds as in my previous cow-pasture-turned garden, so the weeding only took about 20 minutes. 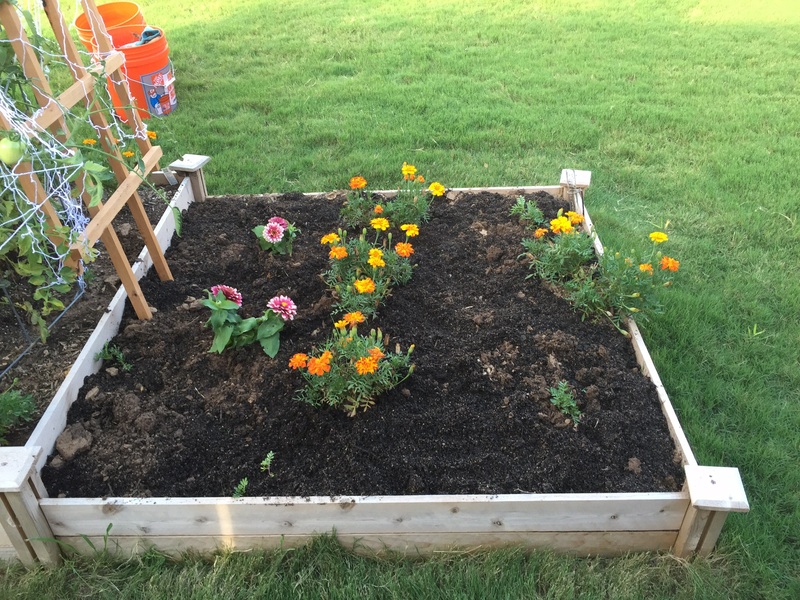 Before I added a bag of dirt to each end of the raised beds, I deadheaded all the marigolds and scattered the seeds. If even one-tenth of the seeds sprout, I’ll probably be trying to find homes for some of them elsewhere (i.e. neighbors). Moveover marigolds. Meet your new roomie, these lovely pink and white zinnias. I also pulled a number of soft, rotting onions from one end of the bed. While the marigolds, tomatoes, basil and chives have loved all the rain, the onions not so much. Hopefully, a few will make it. 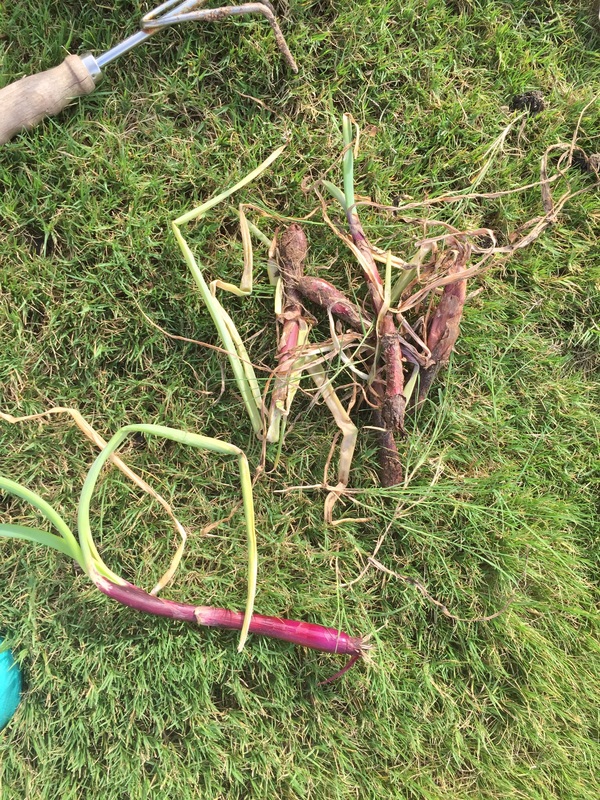 The rain has taken its toll on my red onions. Now, all that’s left is to wait and watch. It’s your move, you dirty little birds. 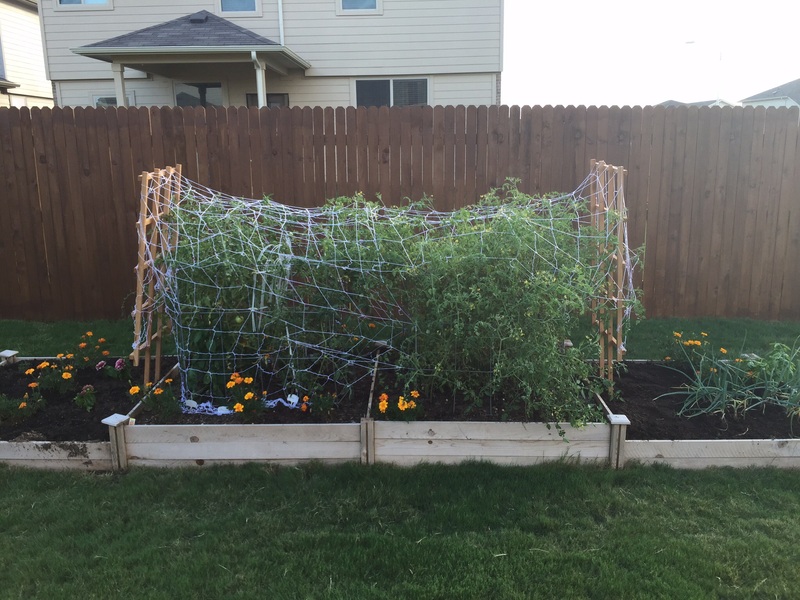 This entry was posted in Gardening and tagged bird, tomatoes on June 29, 2015 by Julie Riebe. My husband said to tell you they are looking for a source of water if they are eating your tomatoes. Putting a bird bath with fresh water nearby should keep most birds from bothering them. Hope it works.